Sometimes your need for heating repair is obvious. Maybe you wake up in the morning and immediately discover that the floor is unusually cold under your feet. Or you come home from work one winter day to discover that, despite the thermostat being set correctly, you don’t dare take off your coat. When that happens, you’ll almost certainly call for immediate boiler or heater repair. But there are times when you’re not quite sure what to do. Much like your car that might “just not be driving right,” you get so familiar with the way your heating unit is working that you just can’t put your finger on what’s wrong. But you know something just doesn’t seem right. If you think there might be problems with your HVAC in Maryland but can’t quite figure out if you should call a heating system expert, here are some things you can check for to either put your mind at ease or cause you to pick up the phone and call for heating repair. The first time you start up your heater in winter, whether it’s in September, October, or November, you’ll probably notice a smell that’s slightly wrong. This is usually because the furnace has been off for six months and has gathered some dust, which it’s burning off. It’s also kicking up dirt and dust in the ducts, heating it up and sending it through the house. This smell seldom sticks around for more than 10 minutes. But what if you’ve been using your furnace for weeks and suddenly notice a smell coming from it? You’ve even verified that it’s coming from the furnace by standing over the vent and taking a deep breath. If that’s the case, then there are a few things to check before you give us a call. Something in the vents – This is something you don’t want to think about, but there could be something in the vents that’s causing the smell. It could be a rodent that has died, or a piece of food that the kids dropped in that’s decomposing. If this is the case, it could be time to call an HVAC cleaning. Your furnace filter is excessively dirty – If this is the case, you can certainly take care of it yourself by simply replacing your furnace filter. Not only can it get rid of the smell, but it will also help your furnace run more efficiently. Something is burning – Yes, natural gas and oil are supposed to burn in your furnace, but your electrical components aren’t supposed to. If you smell something that smells electrical or plastic-y in nature, be sure to contact us right away before the problem gets worse. There could be a leak – Smell gas? Get out! While you can’t smell carbon monoxide, you can smell natural gas that hasn’t been through the furnace yet. A chemical called mercaptan is added to natural gas in order to let us know there’s a leak, and if you smell it then you should get out and call 911 or the gas company right away. In general, you’re not going to notice your heater turning off and on. If you do, it will be in the middle of the night when you can’t sleep and you notice every sound that you tend to ignore during the day. So if you do notice a different sound during the day, it’s probably something you should pay attention to. If there’s an extra bang either before or after your heating unit activates, you’ll want to give us a call. If the drone coming from the vents seems to be off in any way, it could be because the sound is mixing with that of a grinding fan. Head to your furnace room and take a listen while the unit is on. If there’s anything that doesn’t sound right, it’s probably time to call for HVAC repair. Of course, boilers are a different story because they’re quieter than furnaces in the first place. If you hear anything out of the ordinary, such as clanging or clacking, be sure to give us a call. It could be that you have a leak and there’s air in the pipes, which is making your system less efficient and could cause it to fail completely. After a homeowner has been in a house for over a year, they have a pretty good idea of what to expect from their bills. The water bill and electricity bill go up in summer, due to the sprinklers and air conditioning respectively. During that same time, the natural gas bill goes down because the furnace isn’t being used. Even during the middle of winter, heating costs don’t tend to fluctuate more than $10 or $20 between months. So if you’re accustomed to getting a bill that’s $125 and your open the envelope to discover one for twice that amount, you’re probably going to think one of two things: a) it’s a mistake, or b) your last check didn’t make it to them and you’re paying for two months at once. But if neither of these scenarios turn out to be the case, it’s time to contact a technician to have your furnace checked out. It could be that it’s working much less efficiently for some reason, which could require a minor or major repair. A properly functioning furnace or boiler will come on when it needs to and turn off when it reaches the right temperature. On a warm October day, it might not come on at all. But on the coldest day in January, it might be on more than it’s off. If you’re listening, it might turn on just ten minutes after it took a rest. But a unit in need of heating repair might never turn off, and even worse it might be pumping out lukewarm air instead of warm air. This could be a thermostat problem, but it could also be a problem with the actual unit. 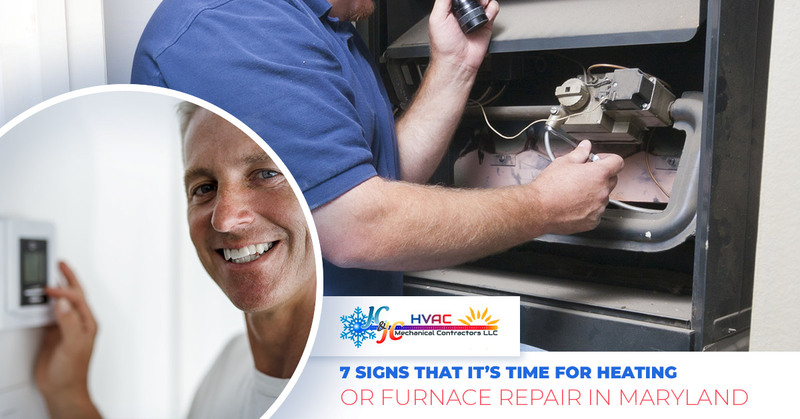 When that happens and your house gets cooler and cooler, you probably won’t need any prodding to call for furnace repair. This one might sound obvious, but if you tend to keep the thermostat at 68 degrees and you turn it up on a cold night only to discover that it’s not getting any warmer, it’s time to contact a heating repair technician. Sometimes the reason that you can’t tell a difference when you turn up the heat is that something is wrong with the airflow itself. The furnace might be working perfectly fine, but it the air isn’t moving through the house then there could be something wrong with the fan. Unfortunately, that means that the heat is staying in the furnace, which puts additional stress on its metal components. If you have any indication that there’s something wrong with your furnace or boiler, you should give heating repair technicians a call. But even if you aren’t having problems, you should call us anyway for regular furnace maintenance. This helps to fix small problems before they become large problems. No matter the problems you’re having or if you simply want to keep your heating unit functioning as smoothly as possible, JC & JC HVAC Mechanical Contractors is here for you. Contact us at the first sign of trouble!